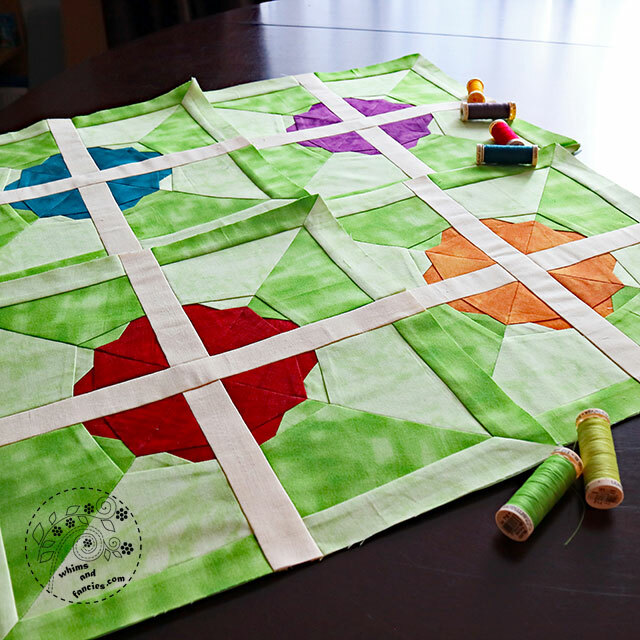 I am making a quilt for my kitties using one of my old patterns, Pinwheel Flower. 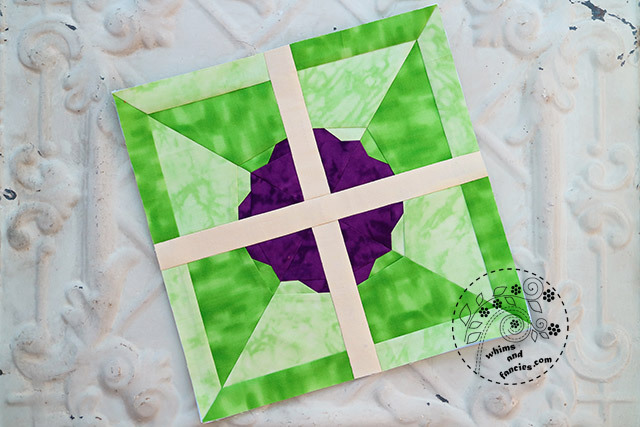 I often get asked about how I choose colours for the blocks I make from my paper piecing patterns. For me they are illustrations done in fabric, so most of the time it is very akin to how I paint. I will try to show my selection process. I use colours and prints together to create a certain style, mood, or even a season. 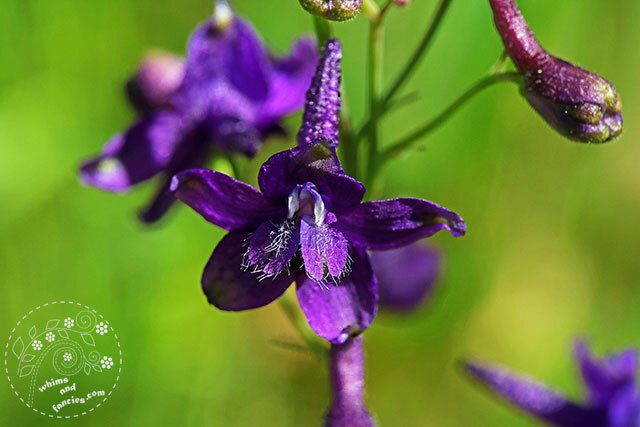 I took this photo of a little purple larkspur flower during a hike. 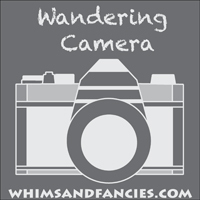 I was looking for tiny little wild flowers for photography and my husband found this one for me. 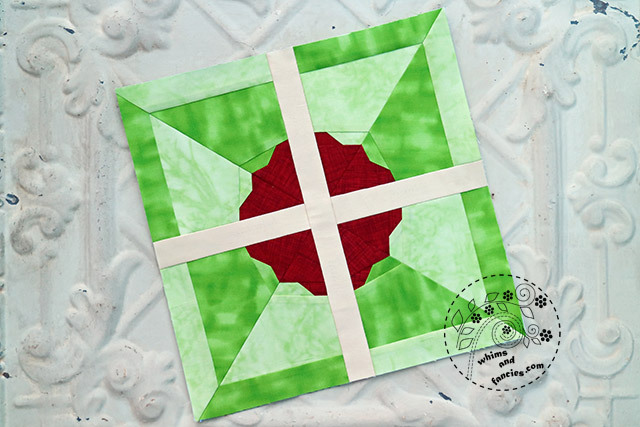 As this photo was my intial inspiration, I chose green for the quilt background. Most of the time though, the background is the last fabric I select. No matter what the order is, I like the design of the block to stand out against the background colour and/or print. If I don’t get the right contrast, I change out the fabrics until I am satisfied. I wanted the flowers to pop against the background without being too bright. It was also important to have a balanced ratio of cool and warm colours. 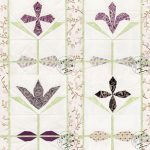 From the very beginning, I was sure about the purple flower from my photo appearing in the quilt. The other cool colour choice would be a shade of blue. After trying out quite a few mid- to dark blues, I settled on this teal. I adore that colour, but I don’t get to use it too often. I also have only a little bit of it left, just enough for my little kitty quilt. I love yellow flowers. A vase full of yellow Chrysanthemums cheers me up immensely. Unfortunately, yellow was not dark enough to provide enough contrast against the green, so I picked the next best – a burnt orange. For the last colour, I looked to our garden for inspiration. We have two wildflower plants with the brightest shade of red flowers blooming in our garden. The whole plant looks like it is bursting into red fireworks. That became the red flower in my quilt. 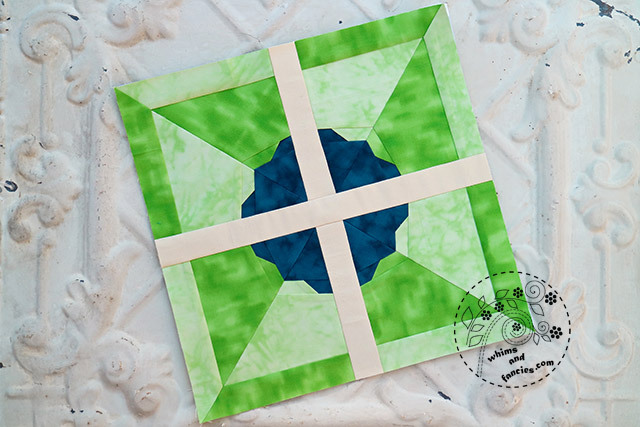 The idea for this block came from a combination of seeing a flower through my atelier window and a pinwheel block. For sashing, it was going to be either white or cream fabric to represent the window frame. Since the green I chose was a warmer green, I used a yellowish-cream for the sashing. Once I finish selecting the colours, I start on the prints. I think about what the quilt is supposed to represent. That helps me decide on the style as well as giving the quilt a sense of coherence while I choose the prints. When I show you the finished quilt, you will see why I used blender fabrics for this one. I love your inspiration from flowers. I’ve been watching the Chelsea Flower Show all week and the designs have been wonderful. Popping back for another visit after receiving your e-mail! Lucky kitties. Those little flowers are a gorgeous colour. Great inspiration! 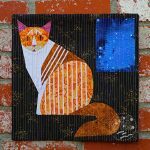 What is your favorite medium painting or quilting? What beautiful square that are just as pretty as the flower! I love the quilt pieces. We’re hoping to travel to British Columbia to visit a dear friend next week. She was always a quilter, until she lost most of her eyesight. However, she didn’t give up — she can see out of small bit of one eye, and has taught herself to thread a needle and now makes quilts despite being blind. I treasure the bed-size quilt she made for me some years ago. I love the green background in this piece, it’s so vibrant and makes the rest of the colors really shine. I enjoyed reading how you select your colors. Great little quilt and you have described your selection process so clearly. Thank you for sharing your thoughts. 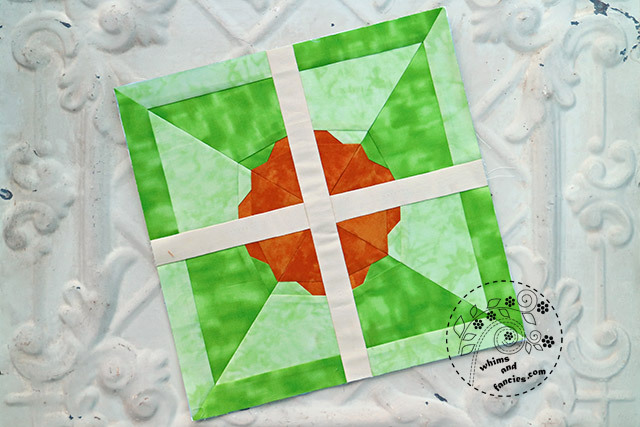 What a clever version of a pinwheel, and it’s so interesting to follow your process for choosing colours. Beautiful blocks. I really like how you used tone on tone fabrics instead of solids, they give so much depth and more of a handmade/painted look to the design. I so admire quilters and love all quilts. Lovely old pattern and I enjoyed your process of selection and inspiration. A beautiful inspirational quilt. I especially love the purple and teal blocks. I can’t wait to see the finished quilt! Thanks for your recent email. I am one of those people who keeps saying “I must learn how to paint” but I never quite get around to it. So, I am looking forward to your posts on how to get started! Have a great weekend! Each of your pinwheels are so pretty. Love the teal one. Those two shades of green are perfect together. Your kitties are very privileged to lay on such a quilt. Lovely how you’ve taken inspiration from nature! 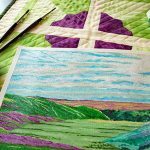 Thanks for showing your wonderful process, the quilt is lovely! This is such a nice pattern. Great design. this pattern lends itself beautifully to adding a center to the flowers, maybe dark brown or yellow with tiny dots. I just finished a quilt with straight strips thru the center of each block, just put a little square into the middle of the horizontal strip (and shorten it accordingly). Those are lucky kitties. Not only do they get a pretty quilt, but they also get a work of art. That is such a lovely shade of green and each of the colors goes so well with it. It was fun to read your thought processes for the piece too. From the description of your process for picking colors, I can tell your artist background plays a big role. 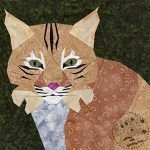 The kitties are sure to love this little quilt. Really nice quilt! It used to take me days to pick fabrics. Now I buy fat quarter bundles and mix and match with that. Many of those will mix with others. Only problem here is the price, and lots of left overs. I have enough fabric for a life time. Hi what a delightful piece this is and I enjoyed reading about your thoughts as you made your various choices.